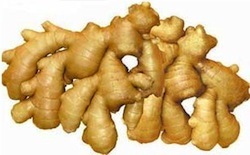 Ginger is a root that is very flavorful and available all year and it produces a hot, fragrant kitchen spice. Young ginger rhizomes are juicy and fleshy with a very mild taste. They are often pickled in vinegar or sherry as a snack or just cooked as an ingredient in many dishes. They can also be steeped in boiling water to make ginger tea, to which honey is often added; sliced orange or lemon fruit may also be added and it can also be made into candy, or ginger wine which has been made commercially since 1740. Ginger is used in everything from soda to stir-fries. Ginger contains several anti-inflammatory compounds called gingerols, which may relieve joint pain, prevent free radical damage, protect against colorectal cancer, and increase immunity. Over 1,600 peer reviewed articles have been published about Ginger. Ginger is also a natural anti-emetic, often used to alleviate motion sickness and morning sickness. Much research has also been published on using Ginger to treat nausea during pregnancy. Research indicates that nine compounds found in ginger may bind to human serotonin receptors which may influence gastrointestinal function and in vitro tests show that ginger extract might control the quantity of free radicals and the peroxidation of lipids. In a 2010 study, daily consumption of ginger was shown to help ease muscle pain associated with exercise by 25%. Steep a couple of slices of ginger in hot water for ginger tea or blend it with soy sauce to top a stir-fried dish.